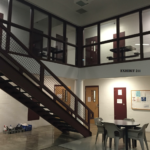 This photo pictures the pod inside the Douglas County Correctional Facility where inmate Rachel Hammers died, in an upstairs cell, on May 12, 2012. The photo is among exhibits in a wrongful death lawsuit filed in federal court by Hammers' father on behalf of her three minor children. Douglas County is asking a federal judge to decide a lawsuit over a woman who died in the county jail, which could avoid the $1.35 million case going to trial. A jury trial to decide the wrongful death lawsuit — filed by the deceased woman’s father on behalf of her three minor children — had been scheduled for this fall. However, the county filed a motion for summary judgement, which Judge Carlos Murguia is now considering. 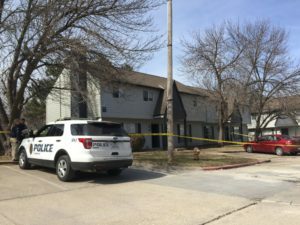 If the case does proceed to a jury trial, the trial date is now set for June 2018, in U.S. District Court in Kansas City, Kan.
Rachel Hammers was 32 when she died — unnoticed by her cellmate and not witnessed by jail staff, according to depositions — in her cell at the Douglas County Correctional Facility in the middle of the morning on May 12, 2012. She is the first and only inmate to die there since the jail opened in 1999. 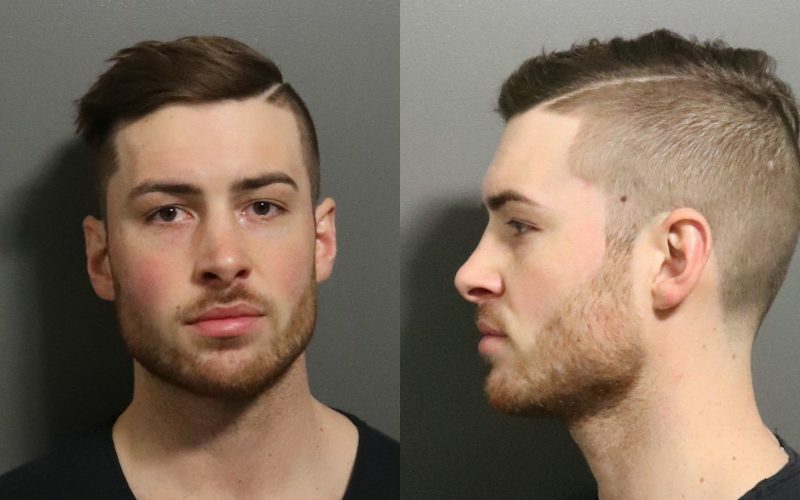 The civil lawsuit has been pending three and a half years, filed first in Douglas County District Court in April 2014 and moved to federal court in 2015. Hammers’ father, Joseph Harvey, a Lawrence oral surgeon, sued the Douglas County Board of Commissioners; Douglas County Sheriff Ken McGovern; Undersheriff Kenneth Massey; three unnamed individuals; doctor Dennis Sale; and the Douglas County Visiting Nurses Association. Harvey’s suit demanded more than $1.35 million for Hammers’ children in reparation for her death. Sale and the VNA reached confidential settlements with Harvey, and claims against them have been dismissed. Claims against county officials still stand. Harvey, in his lawsuit, alleged that Hammers was denied timely access to competent medical care for evaluation and treatment of serious medical conditions, and died as a result of the defendants’ “systemic disregard” of those conditions and accepted correctional medical practices. “Hammers not only experienced extensive pain and suffering, but she died a horrible and preventable death,” the lawsuit alleges. The county denies those allegations, saying jail staff followed protocol and isn’t liable for her death. “The evidence shows that Hammers’ medical condition, even if one were to assume that she died of an alcohol seizure, would not be apparent to a lay person nor even to medical staff,” Overland Park attorney Michael Seck, who is representing the county, wrote in the county’s motion for summary judgement. The county’s motion for summary judgement, the plaintiffs’ response and dozens of supporting exhibits from both sides comprise more than 2,000 pages. There is not a set deadline for the judge to rule. In the meantime, according to court records, a jury trial in the case was pushed back from October to December, then from December to June. The county’s motion, filed in late May, asks the judge to rule that Harvey is not entitled to punitive damages, without the case going to trial. Evidence shows that the defendants — including upper-level county and sheriff’s officials who did not even know Hammers was in the jail at the time of her death — were not deliberately indifferent to Hammers’ medical needs, the county argued. Harvey and his attorneys, however, argue that discrepancies of the facts exist and that a jury trial is needed to figure them out. 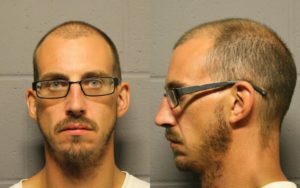 Facts they dispute include whether alcohol withdrawal caused Hammers’ death, whether the jail’s medical screening protocols were adequate and how many minutes passed between when Hammers was found unresponsive and backup was called. Coroner Erik Mitchell ruled that Hammers died suddenly from seizures related to severe chronic alcoholism and probably acute alcohol withdrawal. Four years later, however, he amended his report to remove alcohol withdrawal, saying there was no evidence Hammers had outward signs or symptoms consistent with alcohol withdrawal while she was in jail. Some medical experts hired by the plaintiffs have disputed that, saying they believe she was experiencing alcohol withdrawal that a doctor or nurse would have been able to diagnose, but Hammers did not see doctors or nurses upon booking. Rather, when she did not report any medical problems and jail staff did not observe any, she had been scheduled for one later during her stay at the jail, according to the county’s motion. Hammers had a history of alcohol abuse — she often drank a liter of rum a day — and depression and alcohol-related seizures, but she had no criminal history prior to 2011, the Journal-World has previously reported. But by late 2011, Hammers had two drunken driving offenses and parole violations related to those offenses that led to four previous jail stays. On May 11, 2012, Hammers’ mother was helping with her children, because Hammers was drunk. At one point after Hammers attempted to get more alcohol, Hammers’ mother and father agreed “that the best place for her was in a jail cell” and called police, who arrested Hammers at her parents’ house for a probation violation and took her to the jail that evening. Jail staff did visual “well-checks” on inmates approximately every 30 minutes throughout the night, but did not do them during the day because people are up and moving around, per protocol. About 7:15 the next morning, Hammers and her cellmate had breakfast out of their cell, and neither Hammers’ cellmate nor the supervising officer said they noticed any problem with Hammers. After breakfast, Hammers and her cellmate returned to their cell to nap. The cellmate said she heard Hammers making “weird” snoring sounds as she slept but did not think anything was wrong with her. When the corrections officer called them to shower and clean their cell, the cellmate climbed down from the top bunk and bumped Hammers’ leg on the way down but just thought she was very tired and sleeping hard. The cellmate cleaned the cell, then left to shower and use the phone. At 9:45 a.m., the corrections officer remotely unlocked the cell door and used an intercom to ask Hammers if she wanted to take her free time. After Hammers didn’t respond, the officer went to her cell, opened the door and saw her apparently sleeping. Being the only officer in the unit at that time, the officer radioed for backup so she could enter Hammers’ cell, for safety and to ensure she was not accidentally locked inside the cell by automatic doors. When the sergeant did not arrive, the officer decided to enter the cell alone, using a pen to keep the door unlocked. The officer shook Hammers repeatedly, checked and determined she did not have a pulse, radioed a medical emergency and began CPR. Nursing staff and other officers arrived with a defibrillator, but when they hooked it up to Hammers it indicated there was no need for an electric shock. Lawrence Douglas County Fire-Medical personnel arrived and transported Hammers to the hospital. While they may not have noticed anything alarming, the cellmate and sheriff’s jail staff lacked clinical training and were not qualified “to recognize subtle and non-observable signs and symptoms of alcohol withdrawal and/or seizures,” her father argues in court filings. Harvey also disputes the number of minutes that passed between when Hammers was found unresponsive and when backup, including officers with the defibrillator, arrived. Further, Harvey generally argues that based on Hammers’ prior medical history — including needing medication to help with “severe” alcohol withdrawal during a previous jail stay — jail staff should have known upon intake that she needed to be evaluated sooner and more thoroughly by a medical professional. Prominent Kansas City, Mo., based attorney Arthur Benson is representing Harvey in the case. Benson declined to comment for this story, citing the pending litigation. The sheriff’s office also declined to comment while the case is pending. The county’s attorney, Seck, likewise declined further comment. 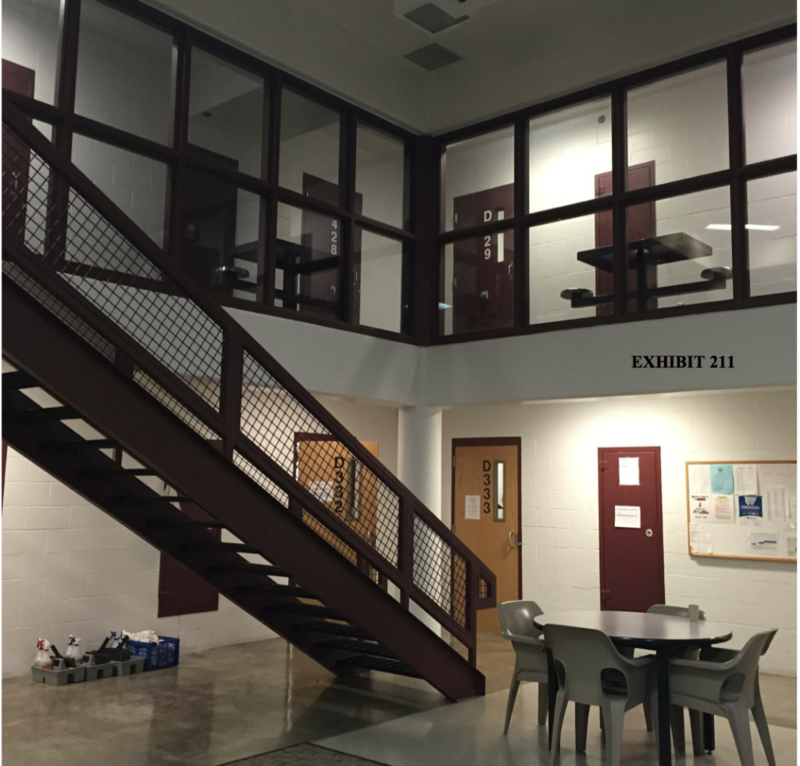 This photo pictures the pod inside the Douglas County Correctional Facility where inmate Rachel Hammers died, in an upstairs cell, on May 12, 2012. The photo is among exhibits in a wrongful death lawsuit filed in federal court by Hammers’ father on behalf of her three minor children.